For many homeowners today, the living room is like a living thing, constantly evolving and changing along with personal style and preference. Once you have selected your furniture, it’s time to pick the color palette for your new living room. The trend in flooring is currently shifting away from dark finishes. In their place, homeowners are incorporating more taupes, ivories and other soft shades. When it comes to wall color, the old tried-and-true tan, or beige, is consistently being replaced by shades of gray. Accent colors also are enjoying a renaissance, including coral, olive and sage, and are being frequently used in many designer collections. With this particular trend, designers are incorporating numerous dark jewel tones, such as deep blues, greens and purples along with blacks and charcoal grays. These dark hues are not only dramatic and elegant, but a great way to add richness to your living room and home. Another big living room trend over the last year has been the idea of “bringing the outdoors in.” One approach is via throw pillows, blankets or wall hangings that feature a botanical or fauna theme. Living walls, or “green walls” are another way to showcase the natural world. These increasingly popular green features can be easily installed and have the advantage of energizing and bringing an overall peacefulness to the living room. You can also bring the outside garden inside by incorporating patterns such as leaves, trees and branches. 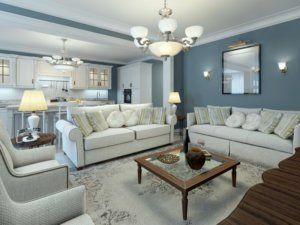 If you’re looking for a way to spruce up your living room, then some of the above design ideas for living rooms are sure to make an impact in your home. At Republic West Remodeling, we can help with all of your home remodeling needs, including breathing new life into your living room. Whether you want to refresh your bathroom, improve your kitchen or build an addition into your home—we can bring your vision to life. Copyright © 2019 Republic West Remodeling. All Rights Reserved.